National Bureau of Soil Survey and Land Utilisation Planning is looking for qualified and qualified candidates to engage 02 vacancies of young professionals. 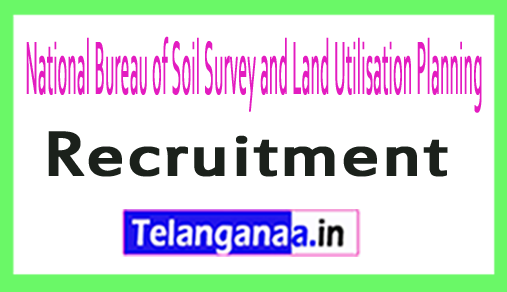 Recently, the National Bureau of Soil Survey and Land Utilisation Planning has published a final announcement regarding the career entitled NBSLSUP Recruitment. To complete this recruitment process, candidates seeking a career in the public sector can attend a scheduled interview on July 20, 2018, at the designated location. Jobs Hunter can read all the recruitment details for NBSSLUP 2018 on this page, which are described in detail by the team at www.telanganaa.in. Qualification required: Applicants must have a Master's degree (Geography / Remote Sensing and GIS / Soil Geology) from a recognized university / institute according to the publication. Participants wishing to join this organization must be between 21 and 45 years old on 07-20-2018. Salary and salary band: those candidates who meet the eligibility criteria required for NBSSLUP vacancies receive a monthly consolidation of Rs. 25000 / - according to the organization's rules. The Candidates The first and necessary step is to visit the official website of the organization, which is http://www.nbsslup.in. Once you have read the complete instructions, applicants must complete the walkin interview along with the documents at the address below. Date for the interview Walk In: ​​20.07.2018. Check the NBSSLUP recruitment notification here.